Richmond FC is happy to congratulate Bruce Pagnucco and Ian Weber. 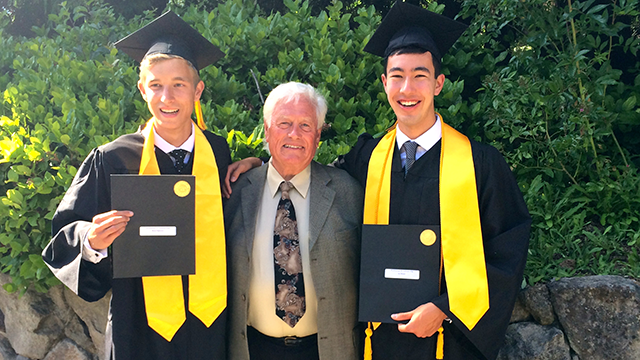 Both men graduated from Hugh Boyd High School this past weekend and are recipients of RYSA’s scholarships for leadership demonstrated both on and off the soccer pitch. Thanks to our Vice-Chair, Mike Fletcher, for presenting the awards. Bruce (pictured left) plays for the U18 Silver Gunners squad, while Ian (right) plays for the U18 Metro Richmond United squad. Well done gentlemen, and we wish you all the very best in the future! Just remember to bring your cleats and ball wherever you go!